Zorian Shkiriak, an advisor to the interior minister, has been appointed as the acting head of the State Service of Emergency Situations of Ukraine in place of Serhiy Bochkovsky, who was arrested and dismissed from office on Wednesday, another adviser to the interior minister, MP Anton Heraschenko (People's Front) has said. 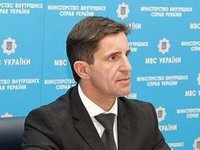 "The cabinet has just appointed Zorian Shkiriak as the acting head of the State Emergencies Service of Ukraine under the proposal of the interior minister," he wrote on Facebook. Prior to that, the government dismissed Serhiy Bochkovsky as the Emergency Situations Service chief and his deputy Vasyl Stoyetsky. The Cabinet of Ministers also dismissed the heads of the regional branches of the service. As reported, Bochkovsky and Stoyevsky were detained on Wednesday during a government meeting based on parliamentary inquiries into corruption schemes in the State Emergency Situations Service. "A pretrial inquiry has revealed a criminal scheme built by the State Emergency Situations Service administration. This scheme's essence is that, as part of government procurements, fuels and lubricants were procured from Lukoil LLC, Alliance, and other companies at significantly excessive prices," an Interior Ministry official said at a Ukrainian government meeting on Wednesday.